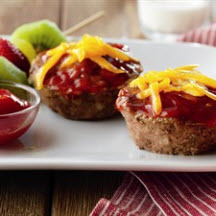 Surprise your kids with their own mini meatloaf for dinner! With five variations to choose from, this recipe is a definite keeper. Combine all ingredients in large bowl, mixing lightly but thoroughly. Shape beef mixture into 12 equal portions. Place into 12-cup standard muffin pan, lightly patting beef mixture to level top. Bake in 350°F (175°C) oven 19 to 20 minutes, until internal temperature reaches 160°F (71.1°C). Remove from oven. Garnish with desired optional toppings. Let stand 5 minutes before serving. Makes 6 (2 mini meatloaf) servings. Italian Mini Meatloaves: Add 1/2 cup chopped mushrooms, 1/2 cup pasta sauce and 1/4 cup chopped fresh basil to base meatloaf ingredients. Bake 22 to 24 minutes, until internal temperature reaches 160°F (71.1°C). Evenly top with shredded Parmesan cheese. Let stand 5 minutes before serving. Serve with additional pasta sauce and garnish with additional chopped basil, as desired. Greek Mini Meatloaves: Add 3 tablespoons chopped Kalamata olives and 1/2 teaspoon dried oregano to base meatloaf ingredients. Bake 22 to 24 minutes, until internal temperature reaches 160°F (71.1°C). Evenly top with crumbled feta cheese. Let stand 5 minutes before serving. Serve with prepared tzatiki sauce. Garnish with sliced cucumber, as desired. Asian Mini Meatloaves: Add 1/4 cup chopped green onions and 1 teaspoon minced fresh ginger to base meatloaf ingredients. Bake 22 to 24 minutes, until internal temperature reaches 160°F (71.1°C). Evenly top with hoisin sauce or teriyaki glaze. Let stand 5 minutes before serving. Garnish with chopped peanuts, sliced green onions or chopped cilantro, as desired. Spanish Mini Meatloaves: Add 1/2 cup finely chopped red bell pepper, 1/4 cup chopped Spanish olives and 1 teaspoon smoked paprika to base meatloaf ingredients. Bake 22 to 24 minutes, until internal temperature reaches 160°F (71.1°C). Evenly top with shredded manchego cheese. Let stand 5 minutes before serving. Garnish with sliced Spanish olives, as desired. Nutritional Information Per Serving (1/6 of basic recipe): 217 calories; 10 g fat (4 g saturated fat; 4 g monounsaturated fat); 108 mg cholesterol; 329 mg sodium; 5 g carbohydrate; 0.3 g fiber; 27 g protein; 6.7 mg niacin; 0.4 mg vitamin B6; 2.4 mcg vitamin B12; 3.1 mg iron; 21.3 mcg selenium; 6.2 mg zinc; 106.8 mg choline. Nutritional Information Per Serving (1/6 of recipe using Italian version): 229 calories; 10 g fat (4 g saturated fat; 4 g monounsaturated fat); 108 mg cholesterol; 381 mg sodium; 7 g carbohydrate; 0.7 g fiber; 27 g protein; 7.0 mg niacin; 0.4 mg vitamin B6; 2.4 mcg vitamin B12; 3.4 mg iron; 21.8 mcg selenium; 6.2 mg zinc; 108.0 mg choline. Nutritional Information Per Serving (1/6 of recipe using Greek version): 222 calories; 10 g fat (4 g saturated fat; 4 g monounsaturated fat); 108 mg cholesterol; 360 mg sodium; 5 g carbohydrate; 0.5 g fiber; 27 g protein; 6.7 mg niacin; 0.4 mg vitamin B6; 2.4 mcg vitamin B12; 3.3 mg iron; 21.3 mcg selenium; 6.2 mg zinc; 107.3 mg choline. Nutritional Information Per Serving (1/6 of recipe using Asian version): 219 calories; 10 g fat (4 g saturated fat; 4 g monounsaturated fat); 108 mg cholesterol; 331 mg sodium; 5 g carbohydrate; 0.5 g fiber; 27 g protein; 6.7 mg niacin; 0.4 mg vitamin B6; 2.4 mcg vitamin B12; 3.1 mg iron; 21.3 mcg selenium; 6.2 mg zinc; 106.9 mg choline. Nutritional Information Per Serving (1/6 of recipe using Spanish version): 229 calories; 10 g fat (4 g saturated fat; 4 g monounsaturated fat); 108 mg cholesterol; 371 mg sodium; 6 g carbohydrate; 0.8 g fiber; 27 g protein; 6.8 mg niacin; 0.4 mg vitamin B6; 2.4 mcg vitamin B12; 3.4 mg iron; 21.4 mcg selenium; 6.2 mg zinc; 108.1 mg choline.